ADD Ethyl Maltol at 1% for more "sugar" or Acetyl Pyrazine at 1% for more "cereal"
This is a very rich and creamy cereal vape. 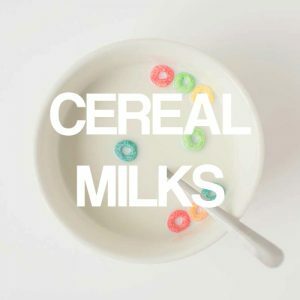 This cereal is unlike any you've had before, no citrus, no lemon, just all sweet and sugary milk, with a few morsels of fruity cereal floating around. This was a recipe that took a very long time to come up with. I was unsatisfied with any of the cereal vapes that were out, they all had this grainy lemon flavor that didn't remind me at all of cereal. So in order to get the flavor I wanted I created this, based on the Cereal Milk Ice Cream bars from the acclaimed Momofuku. This is a recipe that is constantly getting tweaked, as it's not exactly where I want it, but it is still an absolutely delectable and satisfying vape. FA Meringue / Fresh Cream / TFA Banana Cream / FW Hazelnut: These flavors make up the milk. When you smell a bottle of FA Meringue, your immediate reaction is usually "Wow that smells like a bowl of fruit loops". So it only makes sense to use this flavoring as the main note. In order to do that, we need to use this at the highest % we can before it starts to change, and that is at 2%. The fresh cream just adds to the volume of the meringue and really adds more cream to the mix. The secret is the banana cream. The Banana really adds that sweetness you get that is left from the bottom of a cereal bowl. I found this out through long hours of testing cereals, irl, and found that banana really does give a good representation of that sweet, sugary, "fruity" flavor that is left behind. You can't have too much though, because you don't want banana, you just want the sweetness. So TFA Banana Cream being a light flavoring already, using it at 1% really is all you need to get the desired effect. The FW Hazelnut is also a secret weapon. This adds that maltiness that cereal milk is found to have. 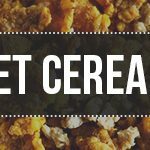 That creamy and sweet hazelnut flavor is what is usually missing from other cereal vapes, and you can tell. So this flavoring really adds depth to the milk, while also giving off those notes that associate more with cereal. None of these flavors can be omitted or replaced, this is a very particular recipe. TFA Brown Sugar / FA Caramel: These are the supporting flavors that help set up the foundation for the strawberry we are adding in. Without these flavors, you don't get that all in one fruit flavor. You need to really add a malty sweetness to the milk and to the cereals, and this is a good way to do that. We use these very lightly because we don't want to add any of their flavor notes, we just want to use them to pull from other flavorings. TFA Strawberry (Ripe): This is the fruit and sugar flavor. Now the flavor that's left behind in a bowl of cereal, is an amalgamation of all the individual sugary fruits. It isn't one particular flavor, and it sure as hell isn't Lemon. I found that Strawberry Ripe, when added in with the other flavors in conjunction, is the best representation of this flavor. It really does taste like that milk infused super sugar fruit. At 3% you don't introduce too much of a true fruit flavor, and you really only get that sweetness it brings along with it. This is a must in this recipe. TFA Graham Cracker / FW Yellow Cake: This makes up the actual cereal. These flavors really make a delicious and sweet grain that gives a nice authentic touch to the cereal milk. They also add that extra flavor and complexity to the milk that gives a nice depth to the mix. Without these flavors, you get a flat flavor, so in order to give some more excitement and authenticity, we need to add in some of that cereal "grain" that you get at the bottom of an eaten bowl of cereal. (OPTIONAL) EM or AP: These ingredients just enhance the overall mix just a tad. I wouldn't really use them both in the same mix, it's either or. If you're looking to bring more sweetness and "sugar" out, you'd want to add in the Ethyl Maltol. If you're looking to add some more to the grain, and cereal, than you'd want to use the Acetyl Pyrazine. Just use a little touch, because a lot of these flavorings already have some of this in there. We just want to give the mix a little boost. You can even use down to just a drop or to per 10ml.